Joe Bateman was a reliever for the Durham Bulls several years ago (2009-2011, stats). Bulls fans will remember that he was famous for getting into very difficult situations, and then getting out of them. Last night Steve Geltz "did a Bateman." After Geltz's colleague, Mark Sappington, threw the ball away to allow a tie game in the 8th, the Bulls came back in the top of the 10th on Jake Goebbert's third RBI of the game that drove in Johnney Field (who was running for Mayo Acosta). The Bulls were up 3-2 when Mr. Geltz came in for his Batemanesqe moment(s). First, he gave up a single to Charlotte's Jacob May. The next batter popped up to Geltz. But May stole second base and then went to third base on a Geltz wild pitch. That put a runner at 3B, one out, and former Bull Jason Bourgeois at bat. Bourgeois at-bat went on and on and on, reaching 11 pitches before striking out. Two outs. Another former Bull came to the plate, Jerry Sands. He hit a fly ball to Dayron Varona in center field to end the game. My cardiologist has a mixed opinion regarding pitchers like Steve Geltz (and Joe Bateman). Yes, it's probably a good thing to get your heart rate up from time to time. No, it's probably not a good thing to do it at 10 o'clock at night sitting in front of your computer staring at the MiLB streaming video. Lots of Bulls hitters had a big day in the first game. Luke Maile had a home run. Richie Shaffer had a home run. Cameron Seitzer went 3 for 3. The Bulls outhit the Knights 14 to 8. But the Knights' two home runs were more timely than the Bulls' home runs. The Knights' home runs came in one inning and one was a grand slam. And that was enough. The Bulls kept it up in the second game with Dayron Varona hitting two home runs and earning a nasty brushback in his last at bat. J.P. Arencibia hit two doubles and a single and broke through the Mendoza line. Two home runs, three doubles, a triple, five singles added up to the best Tm OPS of the year. But it needed decent pitching. They got it from a bullpen crew. Austin Pruitt and Dylan Floro were picked for the International League All-Star Team. Game to be played in Charlotte on July 13th. 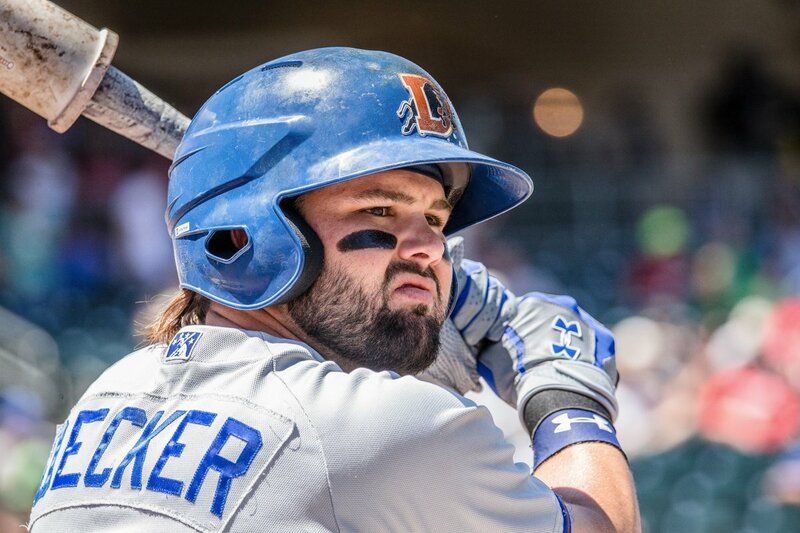 Jaff Decker has been DFA'd. 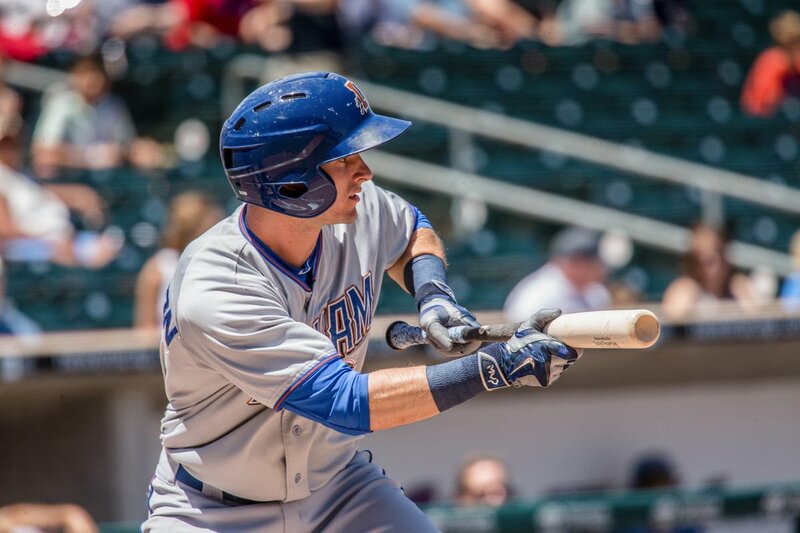 Last night's game in Charlotte got rained out and it looks like the Bulls and Knights will play a double-header this evening starting at 6:05. Assuming usual IL rules, they will be 7-inning games. Demonstrating yet again that WDBB doesn't understand modern baseball, we heard manager Jared Sandberg say in his daily radio interview yesterday evening that Cameron Seitzer "had a good 3-0 swing last night." Our view, as we expressed yesterday, was incredulity that a batter with a .174 batting average, with runners on 2nd and 3rd base and two outs, would be swinging away on a 3-0 count. Seitzer flew out to right field to end the inning. Left-handed starting pitcher Adam Wilk has gone on the disabled list. His last outing was tough, but his numbers (except for won-loss) were just fine. Hope he's back soon. In a bizarre move, Danny Farquhar is back to Tampa Bay. He was called up to a game in Baltimore, sent back to the Bulls, and then called back up in the space of a couple of days. Don't know if he actually made all those trips. Hope not. Right-handed reliever Ryan Webb, who had been with the Bulls on a rehab assignment, has been designated for assignment. That puts two Rays pitchers in "DFA Limbo", Webb and Andrew Bellatti. After a four-game sweep of Charlotte and getting our hopes up, the Bulls lose three to the Iron Pigs. Let's just add a couple of observations to the wrap and Herald-Sun reports. Jacob Faria's Triple-A debut was quite good. He lived up to his promise. Now the Bulls have four good starters in the mix. Just what is Dylan Floro? We've watched him all last year as a starting pitcher. This year he looked to be a long reliever. Then he moved into a closer role and did OK (4 saves, 2 blown saves) at that. Seems to me to be a tough deal to change roles in mid-game, as he had to do last night. At a distance, he doesn't seem to be being treated right this year. Why is a sub .200 hitter swinging away on a 3-0 count with runners in scoring position (Seitzer, 4th inning)? 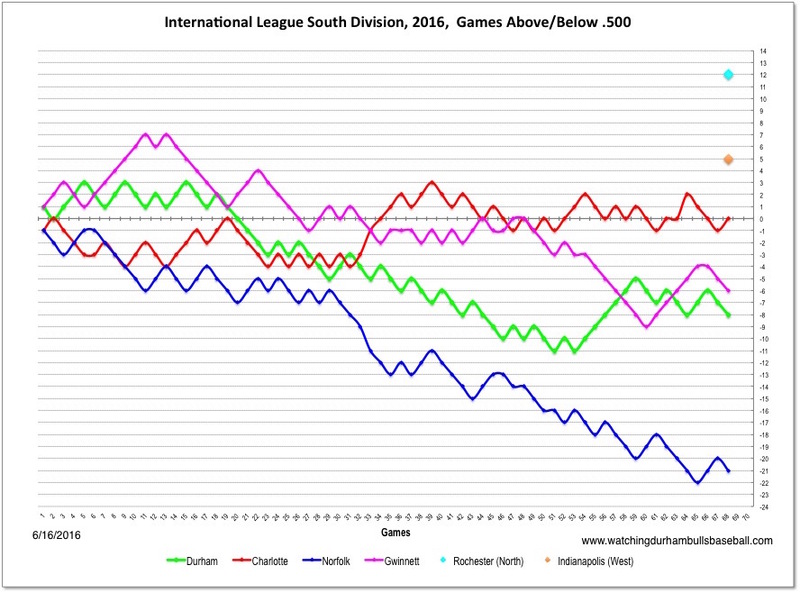 By the way, the Bulls dropped back to third place in the South Division. Steve Geltz is coming back. Danny Farquhar got called up under the double-header roster expansion rule, pitched one inning, giving up a home run, and was immediately sent back. At least I think that's what happened. The Tampa Bay Rays have lost eleven games in a row. 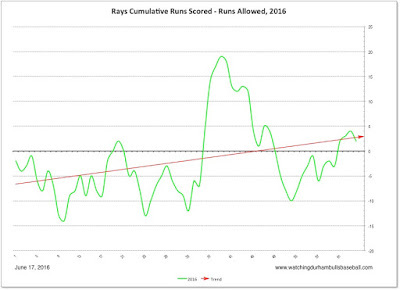 Rays bloggers are speculating about whether or not Rays leadership will blow the team up and hope for better luck next year. Unfortunately for those of us watching their careers, the Bulls who've been called up in recent weeks don't seem to have been able to take advantage of their opportunity (Taylor Motter, Nick Franklin, Jaff Decker). 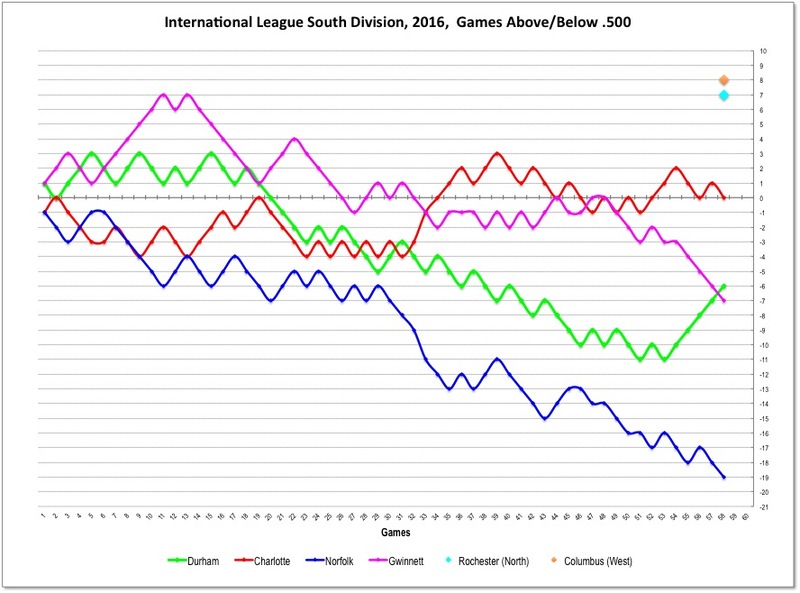 A while back broadcaster Scott Pose made the observation that this year it looks like a team could take the IL South Division just by playing .500 ball. 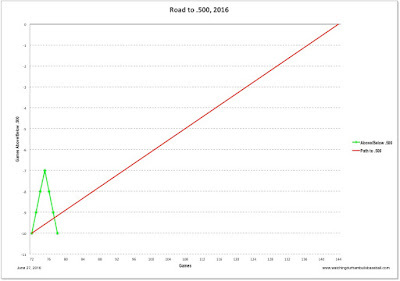 I thought I'd put together a "Road to .500" chart to see how the Bulls were doing toward that goal. From mid-season, 72 games, here's how it's going. Adam Wilk deserved better. He's had three good starts in June, but only one win. Last night he was fine until the 6th. And even then only let two runs in. About the only other bright spot in the game was new guy Eury Perez's first at bat, a double. Plus he scored the first run. 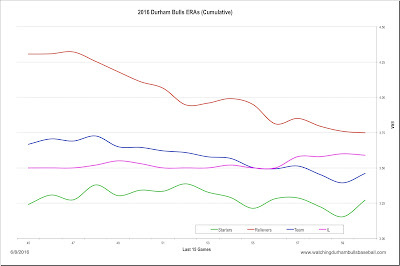 Statistical trivia: The Bulls baserunners have only stolen 1 base in the last 16 games. 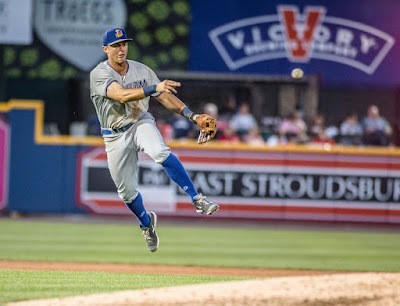 If you want to dig deeper into the Bulls current opponent, the Lehigh Valley IronPigs, check out Kram's look at the 'Pigs at mid-season. Very different from WDBB's approach (here). Nice piece of work on his part. He obviously knows his players well. Reliever Andrew Bellatti has been DFA'd. Remember him? He made 6 appearances for the Bulls at the beginning of the season, none very successful. He gave up 5 runs in 5⅓ innings and then went on the disabled list. I wonder how that works. If a team dumps you, are you on your own for medical care/rehab? If he clears waivers, is Tampa Bay stuck with him? I assume he's down at their facility at Port Charlotte, Florida. The shortest game of the year was one of the most thrilling — home runs, manager tossed, storm clouds hulking over the outfield walls, an exceptional play at 3B, a win (and 4-game sweep), and a move into second place in the IL South. Let's work this back to front, because the end of the game saw a very professional, yet nearly unique play. Weather began closing in around the DBAP in the 3rd inning. I started moving toward the exit above center field in the 4th inning when the rain started blowing in. What was urgent at that time was to get in 5 innings before the weather halted the game. The Bulls were ahead 9 to 1 and if they didn't "finish" soon the game would have to be resumed at some date in the future. The Bulls had a quick bottom of the 4th. Now, if they could just get through the top of the 5th. The first Charlotte batter of the 5th, Nicky Delmonico, floated a popup over third baseman Richie Shaffer's head The wind scrambled things up and the shortstop, third baseman, and left fielder ended up in a cluster around the ball. Richie Shaffer's throw came in to the pitcher Austin Pruit in the middle of the infield and Delmonico figured he could make it to an open third base. He had not counted on the sheer baseball smarts of catcher J.P. Arencibia. Arencibia was at the bag, took Pruitt's throw, and made the out. I don't think I've seen a catcher cover third base before except for a rundown. Terrific play. Perhaps the game-winning play. But wait. There's more. The rains intensified. The next batter grounded out, but it took six pitches to get there. The rain was getting harder. On the fourth pitch to the next batter, a fly ball went to left and Jake Goebbert laid himself out for the inning-ending out. If Goebbert doesn't make that play, the game would be suspended. Instead of eventually being called. Boom! I'm running for my car. The tarp is coming out as the skies opened up. From Charlotte's point of view, I'd guess they'd put it down to sheer bad luck in the 2nd inning. Their pitcher, Scott Carroll had K'd the side in the 1st inning. But Dayron Varona led off the 2nd inning with a home run (his 9th). Then J.P. Arencibia and Luke Maile singled and a passed ball put runners on second and third. Juniel Querecuto K'd for the first out and Cameron Seitzer's ground ball didn't go far enough so that J.P. Arencibia was caught trying to get home. That put runners on 1B and 3B with two outs. It looked like Charlotte was going to get out the inning. Not so fast. Charlotte's third baseman's throw on Johnny Field's ground ball bit the dirt, skipped past the first baseman, a run scored, and Bulls went on the second and third base. Things came undone. Two singles, two walks, and a double later, 6 runs had scored in the inning, Carroll had thrown 65 pitches, and he was out of there. It could have been even worse. Of course, J.P. Arencibia was in the middle of it. On his second at-bat of the inning, he lofted a ball over the Blue Monster that the ump called a home run. That would have been three more runs. It was an obviously bad call to those of us on the first base side of the field (although we were not going to say anything!) and Charlotte players and their manager erupted and got an umps' conference. The umps reversed the call and Jared Sandberg jumped into it. He must've said something ugly, because he got tossed just as the Bulls baserunners were going back to their bases and Arencibia went back to bat. His objection and ejection were particularly silly on Sandberg's part. If anyone should have seen it was foul it would have been Sandberg from his 3B coaching position. What was there to argue about? By my count, that was the third time this season he's been tossed this year. By the way, Arencibia drew a walk. Pitchers were changed. Luke Maile flew out to end the inning with the bases loaded. 12 Durham Bulls came to bat in the inning. In the 3rd inning the Bulls added three more runs on a Jake Goebbert sac fly and a Richie Shaffer double. The rains were coming. Austin Pruitt gets a "complete game" win out of the deal. And he did look just fine throughout. This is a very odd circumstance. 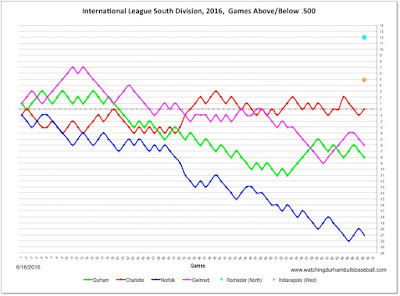 The Bulls were swept three games to Norfolk, the worst team in the International League. Then they win four in a row from the team that leads the IL South Division. Plus the Bulls move into second place in the division even though they are 7 games below .500. Apparently, Shaffer's injury on Wednesday was not all that bad. Reportage on the radio said that when he hit the ground he felt an immediate numbness down his arm and side, something he'd never felt before and that's why he was taken out of the game. In his pregame interview, Sandberg did not sound concerned at all and Shaffer played just fine. Two new Bulls were seen leaning on the dugout rail last night. One transaction has been announced. The other will probably come out today. Eury Perez was acquired from the Houston Astros. He's been playing in Fresno (How come the Astros AAA team is in Fresno, CA?). Looks to be our (or at least WDBB's) kind of guy — a speedy center fielder. Stats. Jacob Faria was also in the dugout. We are assuming he's coming up from Montgomery. The 22-year-old right-hander had a stunning 2015 at Port Charlotte and Montgomery. Less impressive this year with a 4.21 ERA in 83 innings. Still, a legit prospect who chose to go pro out of high school. Radio guys said he was going go into the rotation and that Eddie Gamboa was going back to the bullpen. Stats. Dr. Miraculous has posted his take on the Montgomery Biscuits season to date. The Bulls lost third baseman Richie Shaffer in the sixth inning after he landed hard while diving for a ground ball. He was able to walk off the field. Sandberg speculated that Shaffer may have injured his neck or upper back. Assuming tradition followed, any update is more likely to come from Tampa Bay than local sources, although perhaps from the radio lead-in to today's game. Shaffer's departure led to a reshuffle of folks on the field including bringing in Mayo Acosta to catch. We like Acosta and we could not be more happy to report that he got his first hit of the year after 32 at-bats. Meanwhile, Luke Maile got his first home run of the year, Jake Goebbert got his 6th (plus a sac fly), and Jayron Varona got his 8th. If the name of the pitcher getting the win, Dana Eveland, is new to you, that's because he's new to the Bulls. It was his first appearance in a Bulls uniform. "Well-traveled" would be an understatement describing the 32-year-old's career. He has played for 10 different major league teams and 9 different AAA teams. Experience could be a good thing, though. I'd guess it depends on how he works out in the clubhouse. Gonna be a bit warmish tonight. Predicting 97° for game time. 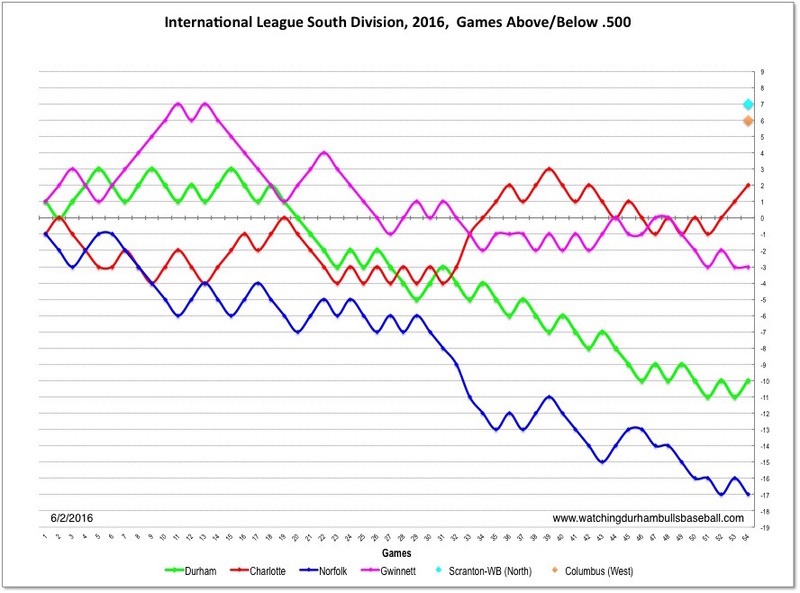 The International League season is 144 games. Yesterday's game 72 was the midpoint. How are the Bulls doing? Not so good. 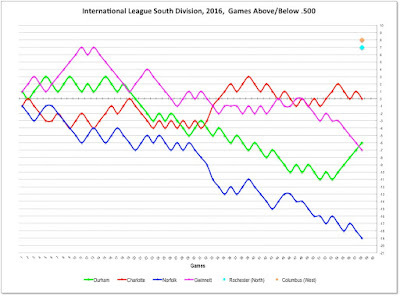 The Bulls at 31 wins and 41 losses are in third place in a very weak South Division. The good news (?) is that a solid run towards a .500 season might get them to the playoffs. Of course, that's exactly what Gwinnett, Charlotte, and Norfolk must be thinking. 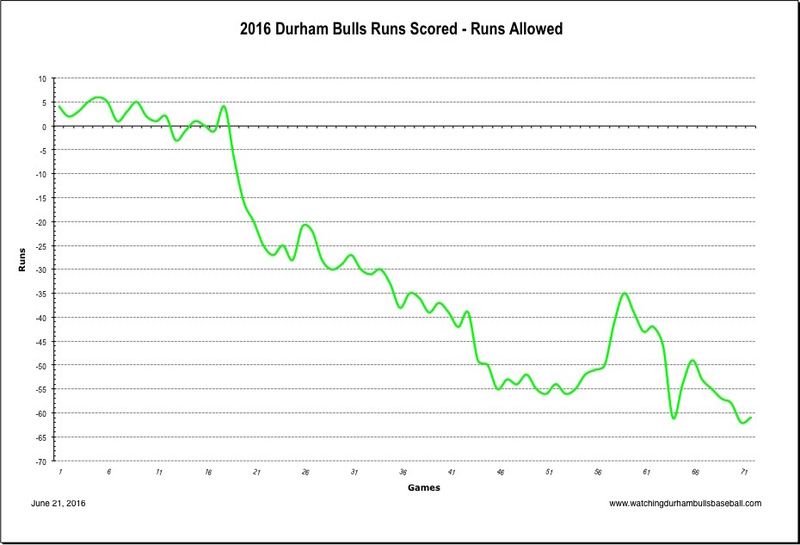 Runs differentials are a good metric to watch and here the Bulls are really in trouble. 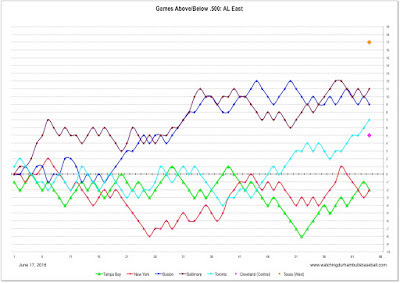 If you crunch this difference (currently -61) through Bill James' Pythagorean Expectation formula you come up with an "expectation" that things should be even worse — a won-loss record of 29-43. How does the current run differential compare to previous years? 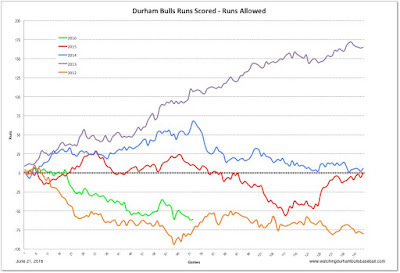 It is approaching that of 2012, the worst year in the Triple-A Durham Bulls history. 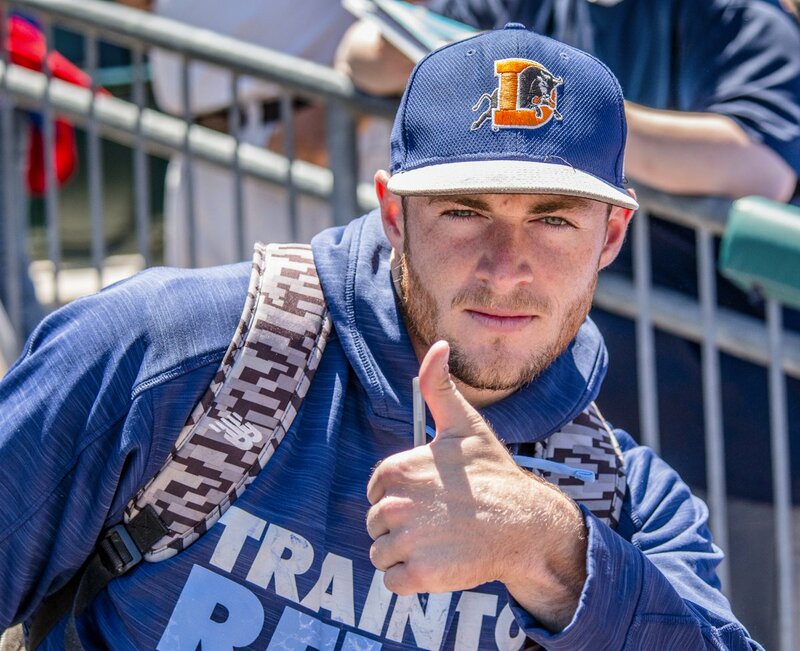 Twenty-five ballplayers have stepped up on the mound for the Durham Bulls this year. Two of them (Mayo Acosta and Dayron Varona) were position players. The performance of all of them is charted below. 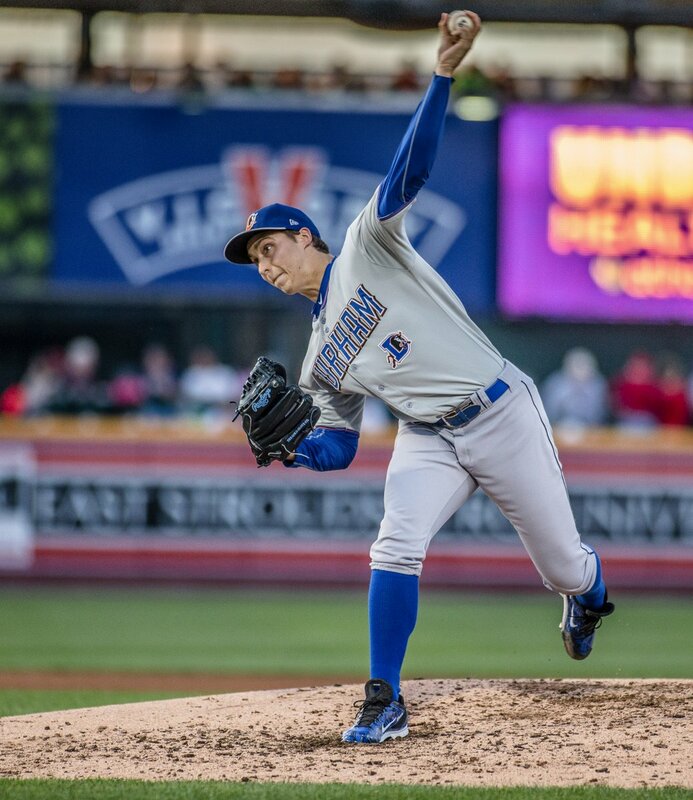 The team ERA of 3.67 is tied for 8th place in the 14-team International League. They strike out a lot of people, 654, and lead the IL in that category. Until recently, the starting crew was doing exceptionally well. However, during this last road trip the starters were getting steadily worse. 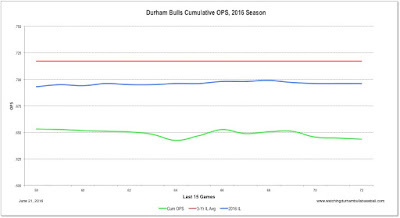 The big issue with this year's Durham Bulls is the weak hitting. 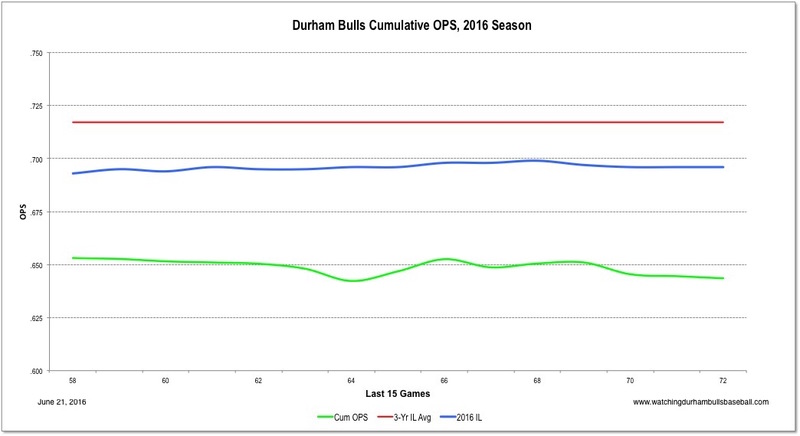 The Bulls batting average, .256, is league-worst, as is the team OPS, .643. Furthermore, the current trend is drifting downward. Twenty different players have come to bat for the Bulls so far this year. None of them has been particularly impressive. Perhaps the biggest disappointment is the performance of the "invitation to spring training/minor league contract" guys. These are the players who usually make a difference. So far in 2016, not so much. We're talking about players like Kyle Roller, Jake Goebbert, Dayron Varona and J.P. Arencibia. My impression is that Dayron Varona is doing better than his numbers show. He does have 30 RBI. We like him. Richie Shaffer, expected to be the big gun this year, has been disappointing. He would surely agree. An oddity in his numbers is that he leads the team in strikeouts (74) and comes close to leading the team in walks (33). Note that the leaders on this board have very few plate appearances. This table is sorted by wOBA. The wRAA stat (Weighted Runs Above Average) gives a sense of what the player is contributing to the team in terms of runs. Here's a way to understand the table. Note that the Bulls have a lot of "awfuls" and only one even "above average." Adam Wilk had a terrific game, leading the Bulls to their sixth shutout of the year. 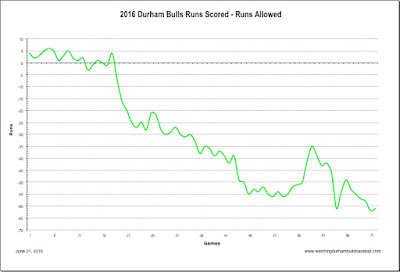 The score does not quite reflect the terrific day the Bulls had at bat, though. As the stats above show, as a team they were well above their season totals: 4 doubles, 2 triples (Johnny Field and Jake Hager), and a home run by J.P. Arencibia (his second in two days) led to 23 total bases. A great day for the Bulls as they took advantage of a bit of turmoil in the Bison’s pitching rotation. In general, the Bulls’ offense has not been kind to Mr. Wilk this year. Several decent efforts were not been rewarded. Last night they were. Plus, he was at his most efficient. He only needed 77 pitches to get through a full 8 innings. That’s just a little over 3 pitches per out. To put that in context, the typical Bulls pitcher this year averages over 5 pitches per out. Over 75 innings this year, Wilk's only allowed 9 walks. In other words, if you’re a batter you might as well swing, because the ball is going to be over the plate. Nick Franklin is back. Unless I’m reading the stats wrong, he essentially had a “Moonlight Graham” visit. He had a grand total of three plate appearances in three games, drew two walks, and had one inning in left field. In his one recorded AB he pinch-hit for pitcher Matt Moore in an interleague game and flew out to center field. His sacrifice fly in last night's first inning scored what turned out to be the winning run. His ground out in the 5th to deep short brought in another run. Franklin has 25 RBIs on the year and I’m happier that he’s here rather than sitting on a bench in St. Petersburg, even though I’m sure he isn’t. Juniel Querecuto was sent to Montgomery to make room for Franklin. 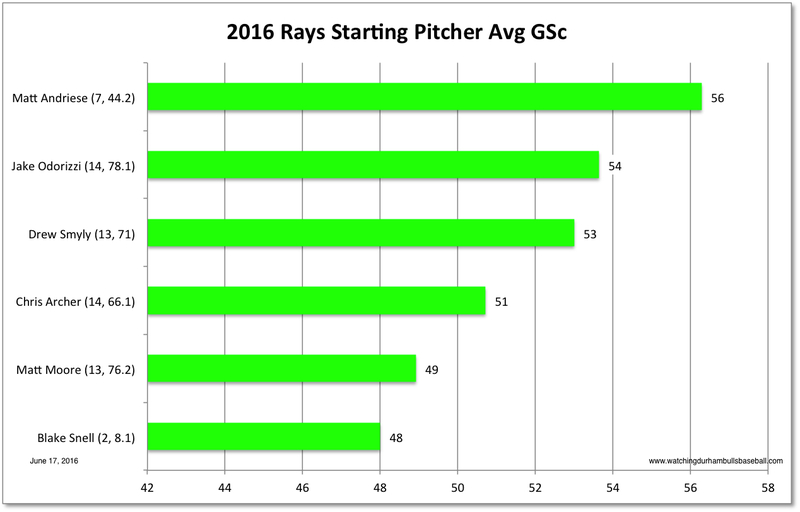 No one has been named to fill the hole that Blake Snell will leave behind. Note that the Bulls just played a series against the Iron Pigs in Coca-Cola Park and now they are playing a series against the Bisons in Coca-Cola Field. Seems like Atlanta’s favorite beverage has made a lot of folks rich up in the North, rich enough to want to name a ballpark after their business. Keep an eye out for a pitcher named Jonny Venters, who is working his way up through the system. He is coming back from his third Tommy John surgery. Stories at MLB Trade Rumors and Rays.mlb sites. 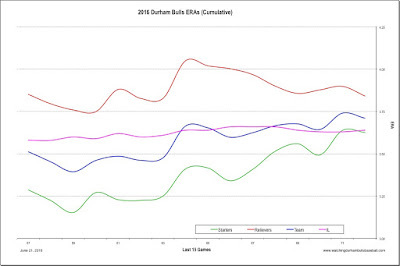 After getting shut out on Friday (0–4) and absolutely hammered on Saturday (1–16), it seems only fair that the Bulls could come back and win going away (10–3). That the winning hit came in the first inning by a grand slam from a guy who started the season with the ’Pigs seems only fair as well. J.P. Arencibia, batting 6th, came up with 2 outs and the bases-loaded and hit the first grand slam by any Bull this year. Three more runs in the 4th, and another three in the 9th put the Bulls in double digits for the first time in 2016. Those three runs in the 9th came from a Jake Goebbert home run, his 5th of the season. Possibly a good time to wonder what his left-handed bat is bringing to the team. He is hitting just .189/.299/.315, but for this weak-hitting team, he’s among five other players on the active roster who are below .200 and when you dive into the advanced stats, his wOBA is .264 which puts him 6th out of the active bunch (remember that Mahtook, Franklin, Corporan, Leonard, Motter, and Acosta aren’t on the current roster). But, again, it isn’t stellar company. And yet his history is strong. He’s more than 200 points below his career Triple-A OPS stats. Does he just need to get used to being on the East Coast? Austin Pruitt’s last time out was pretty shaky. This time, he looked great. If I were in the second-guessing business (Me? Second guess? ), I’d point out that leaving him in to begin the 8th was a risky move. But, no harm was done and Pruitt got past the 100 pitch mark for the first time this season. Blake Snell has been called up to start a game against Seattle in a couple of days. Hints are that he might stay with the Rays. No word on a corresponding roster move. Former 2016 Bull Matt Andriese will be moved into a relief role. Cheryl Pursell (@CherylPursell) is an obviously talented photographer who's work sometimes appears on the Noise Nation website. She tweeted out several photos of Bulls during their visit to Allentown. Thanks, Cheryl!! 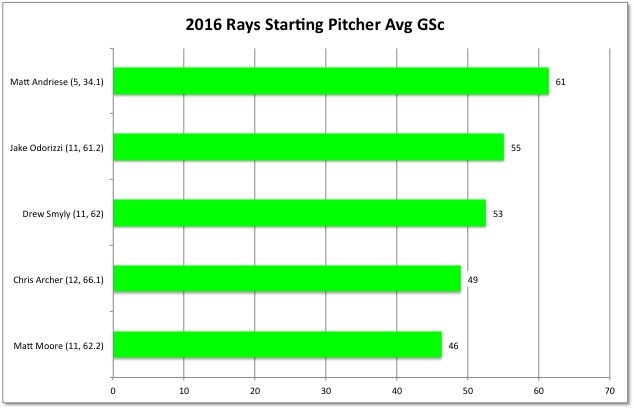 OK, I get it that Blake Snell is a super-star in the making. And he did have 13 strikeouts last night. What I don’t get is why no one is pointing out that he also lost the game. 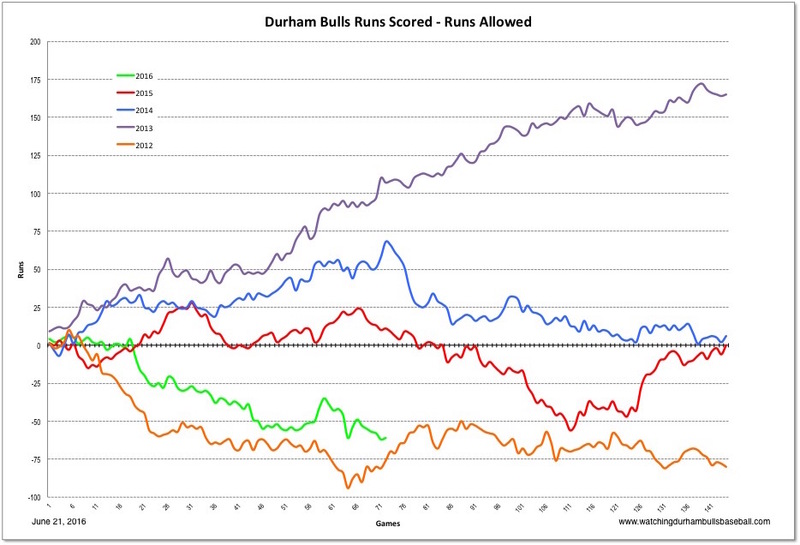 Yes, the Durham Bulls could have at least scored a run or two and instead were shut out for the 11th time this season. However, it was Snell that gave up 7 hits and 3 runs. And it’s Snell who has the worst WHIP among the top four Bulls starters, the worst ERA, and is the least efficient (pitches per out). The young man, as impressive as he is, has a ways to go. He will undoubtedly get there. As a Bulls fan, I’m reminded of David Price’s tour as a Bull. He also was a great pitcher in the making, but he didn’t really help the Bulls win many games. Meanwhile, thanks to Cheryl Pursell (@CherylPursell) who takes photos for the Noise Nation blog. Great shots from last night. It does look like Richie Shaffer is figuring out where to land, doesn’t it? Check out the Noise Nation blog for another look at Snell’s performance. And what’s that “cheesesteaks” business all about? The Philadelphia Phillies Triple-A team, the Lehigh Valley IronPigs, are blessed with the only other Triple-A fan blog I know of, Noise Nation, so they must be something special. Plus they get pretty decent coverage from their local newspaper, the Allentown (PA) Morning Call. As might be expected, given their proximity to Philadelphia, coverage is very Phillies-centric. That's different from what we denizens of the DBAP experience. It’s pretty hard to find a Rays fan at the park. In fact, one of my most frequent questions at a game is who the Bulls are affiliated with. 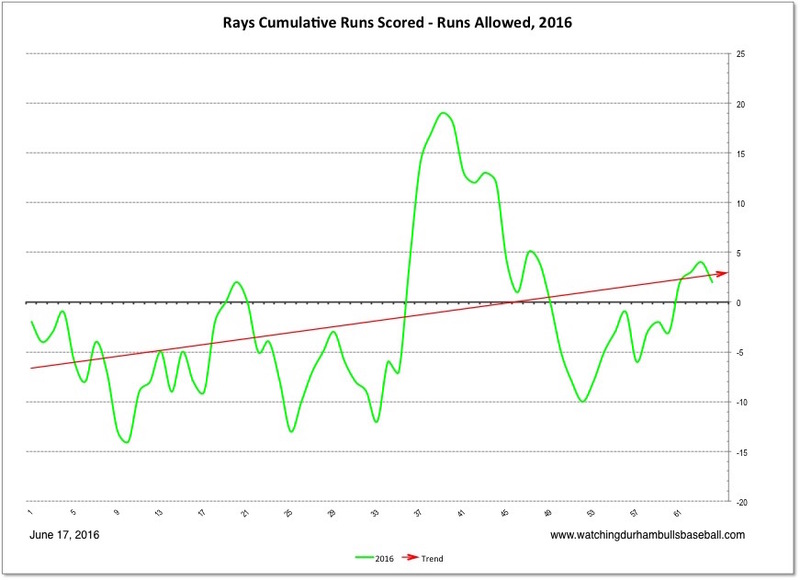 We’re a narrow-minded lot who tolerate the Rays only as long as they give us a decent team to watch. 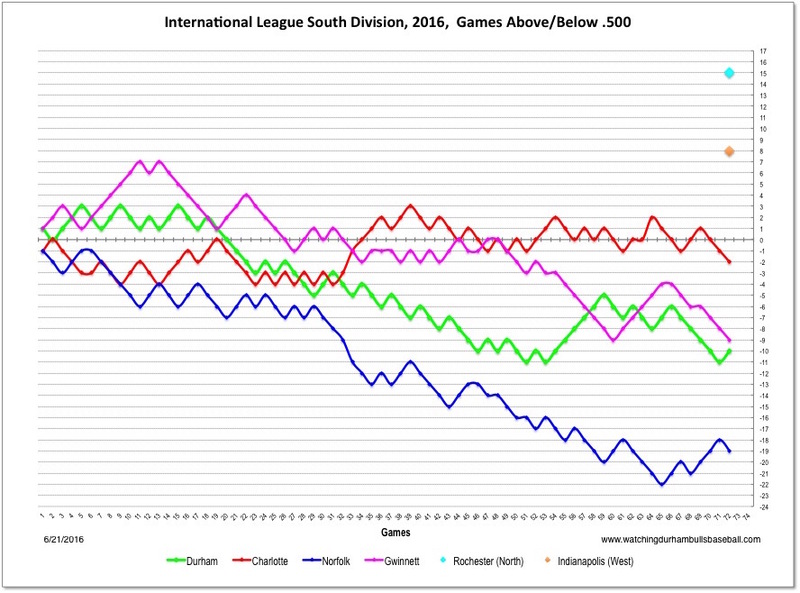 The North Division of the International League is very competitive this year. At the moment, the IronPigs are tied for third place but are only 2½ games out of first and only 1 game ahead of fourth place. Standings. 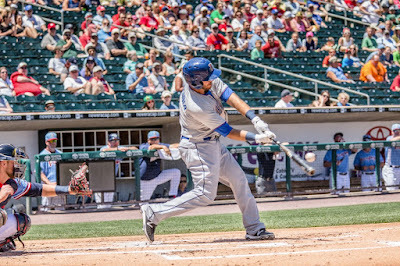 The Bulls’ J.P. Arencibia started the season with the IronPigs, so we can expect possibly an even higher level of chatter between him and his former teammates. The matchup is mostly in favor of the ’Pigs. They are near the top of the league in hitting, much better than the league-worst Bulls. 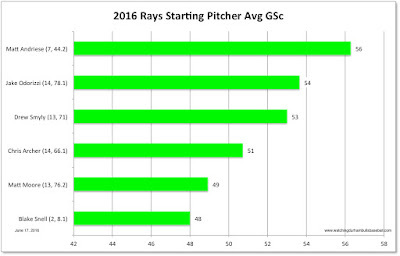 The Bulls have a slight edge in pitching. This is going to be a challenging set. To give credit where credit is due, pulling Justin Marks at the end of 6 innings was the right call. Marks had pitched his best game as a Durham Bull through 6 innings, 86 pitches, 8 K’s. He survived a shaky 4th and came back with two solid innings. His game score of 61 was also his best of the year. Time to rest on his laurels. He was followed by Eddie Gamboa’s terrific 2 innings and Steve Geltz’s heart palpitating 9th when he closed out the game with a K of pinch-hitting Mike Yastrzemski with runners on 1st and 3rd. Rehabbing Logan Forsythe’s home run was all the Bulls could do at bat until the 7th. In fact they came into the 7th with just two hits of any kind. 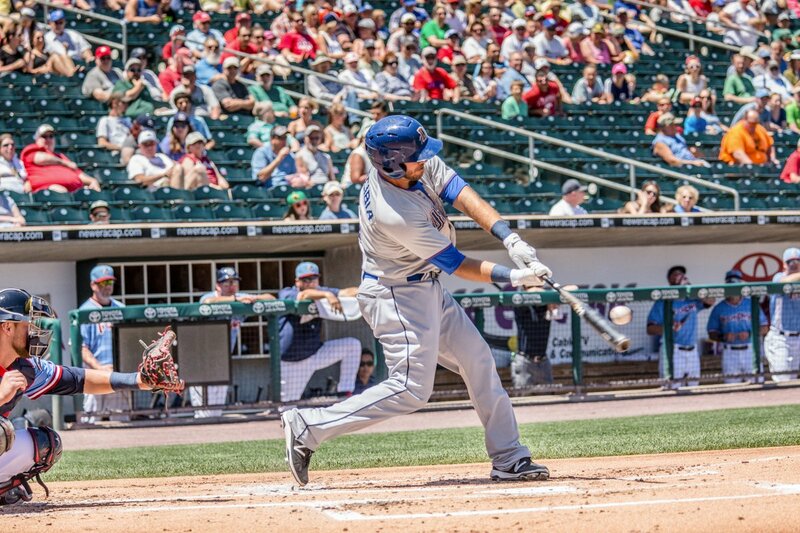 Then Jaff Decker got a single and Jake Goebbert’s home run brought in the winning run. Nice crowd of 10,000+ watched the shortest game of the year, 2:01. Got to figure that Logan Forsythe will be heading for St. Petersburg, which raises the question of who will be kicked off the Ray’s bus. Very likely to be one of these guys: Tim Beckham, Taylor Motter, or Nick Franklin. The stats don’t tell you much of anything (none of them is hitting well), so you have to think that Tampa Bay will be looking at an assessment of team defensive needs and who is most dependable off the bench as a platoon player. The Bulls leave town until June 20th. First chance for the turf to “rest” in a long while. Well, it couldn’t last — the winning streak, I mean. Sure was nice, though. Yesterday, however, nothing went well for the Bulls. Austin Pruitt was coming off a terrific start, but found himself in a six run hole before the 2nd inning was over. Even when the Bulls hitters seemed to get a handle on rehabbing Oriole Yovari Gallardo, especially Jake Goebbert’s 2-run homer, it was too late. Here’s some more details about Jamie Schultz's near-perfect game. Here’s a bit of trivia that I’d not heard before. When major league pitchers are rehabbing in the minors, they are provided major league baseballs to throw. Is that so? Maybe a reader will fill me in. What would be the difference, I wonder? 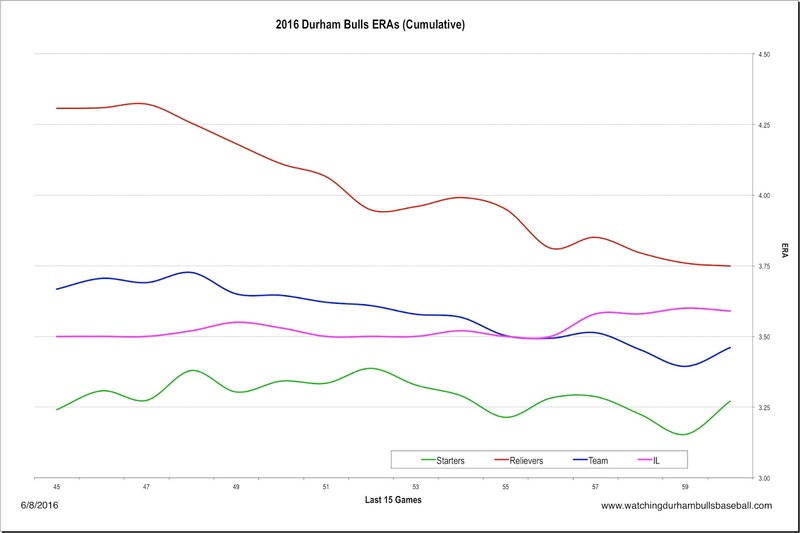 Yesterday was not a good day for this year’s Bulls in the big leagues. Box. Taylor Motter started at 3B and went 0 for 4; Mikie Mahtook started in right field and was 0 for 3; Nick Franklin pinch hit and flied out. However, Ryan Garton did come on to pitch with one out in the 8th and had 2 K’s to finish the inning. This is a pretty picture. 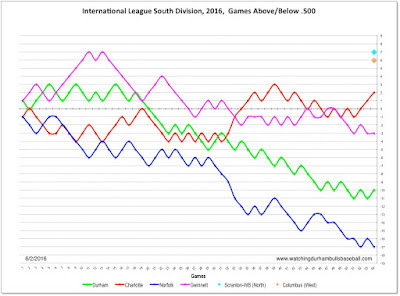 The team ERA (3.46) is now below the International League ERA (3.59). The big improvement is the relief crew. Over the last 15 games their combined ERA has dropped from 4.31 to 3.75. There’s a lot of ways to look at this game. I commend both the Bulls’ wrap and the Herald-Sun stories above. The Bulls did get a bunch of freebies, 11 walks and 3 hits by pitch. 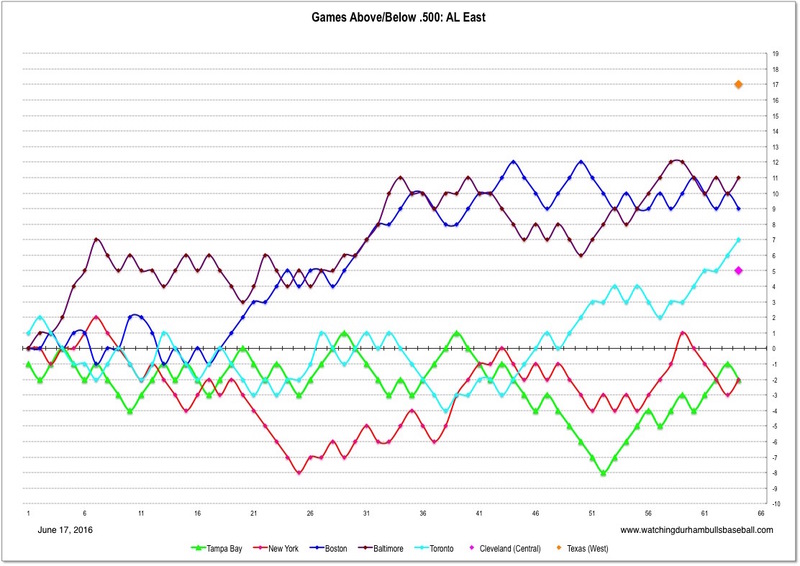 For WDBB, however, let’s look at the path that Mayo Acosta took in this game as he went from hero to goat to hero. For those who don’t follow the Bulls closely, Mayo Acosta is primarily the #3 catcher who comes and goes from the active roster and rarely starts a game, only 9 this year. Last night was his first start since May 10th. His first “hero” moment came in the 5th when he outlasted Gwinnett’s pitcher and managed a walk that pushed a run in from 3B, starting a three-run inning that put the Bulls ahead 8 to 3. But then came his first “goat” moment in the 8th inning after Steve Geltz had come in with two outs and nobody on base. Although Geltz got a strikeout, the ball got past Acosta. The batter went to first. The next two batters got on base and a bases-loaded walk from Geltz let a run in and the Braves got to within two runs of the Bulls. Acosta’s second “goat” moment came in the bottom of the 9th, after the Braves had tied the game in the top of the 9th. He came to bat with a runner on first and no outs, but could not get a bunt down. But (trumpets please!) came Mayo Acosta’s big hero moment. He came in to pitch in the 10th inning and got three quick outs. The Bulls scored a run in the bottom of the 10th and Acosta got the win and all the appropriate hero accolades. The last time the Bulls won four games in a row was a streak that began in late August, 2015. Marc Topkin, Tampa Bay Times sports writer has some suggestions for the Rays that could affect the Bulls: Send Desmond Jennings to Durham, call up Blake Snell, call up Daniel Robertson. Worth a read. Buffalo, Scranton/WB, and Rochester are in a three-way tie for first place in the North Division. Standings. 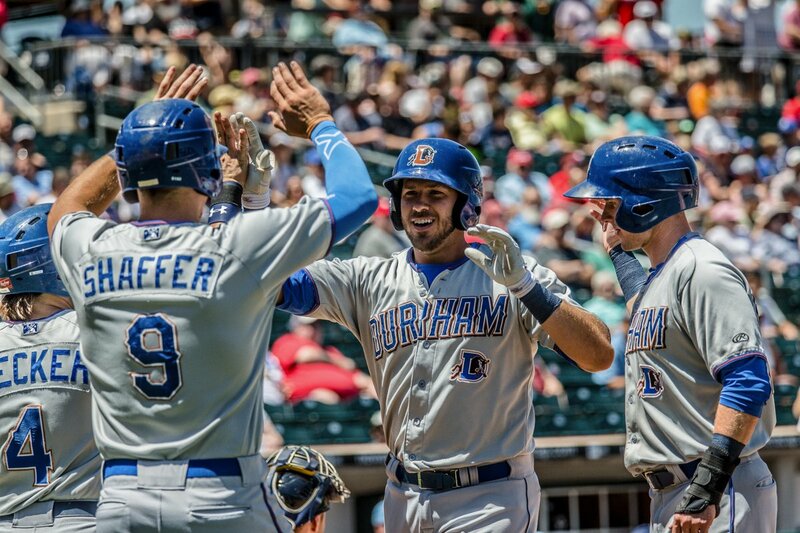 Jaff Decker’s two solo home runs provided the thrills and Austin Pruitt provided the strong right arm for a very good game. 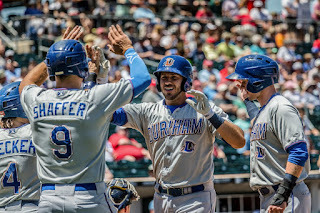 The game also marked just the third time that the Bulls have won two games in a row this year, the last was May 7 & 8 (those two extra-inning marathons against Norfolk). Plus it was just the third shutout for Bulls this year. Austin Pruitt has emerged as the Bulls most successful pitcher this season. His two starts with Game Scores of 78 are the best by any Bulls pitcher so far. Over his 11 starts he has a team bests for starters of a WHIP of 1.01, an ERA of 2.48, and FIP of 3.05. For what it’s worth, he’s also the Bulls most “efficient” starting pitcher, using up only 4.73 pitches per out. Oh, he’s picked up 4 wins against 3 losses over the year as well. 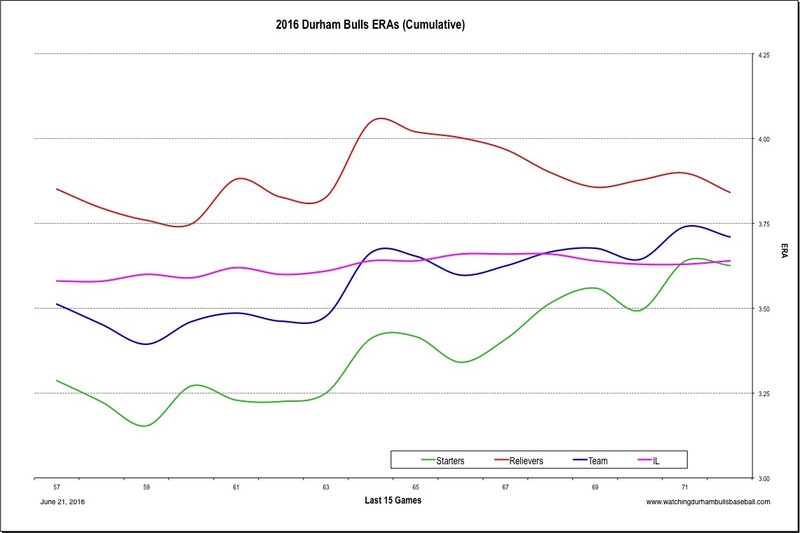 The Bulls team ERA dropped down to 3.50, exactly the International League average. I'm obviously a big fan of the Game Score stat. It seems to me to be a straightforward way to look at starting pitchers. Here's how the Bulls crew looks for the year. 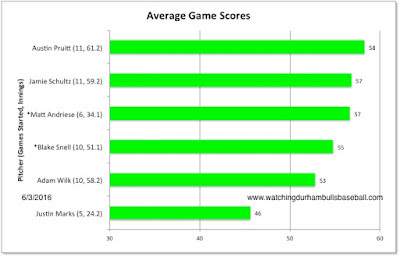 A Game Score of 50 can be considered to be about the same as a "quality start" in the lingo of broadcasters. Blake Snell is on the 40 man roster and, of course, Matt Andriese isn't with the team any more. These are pretty good numbers. 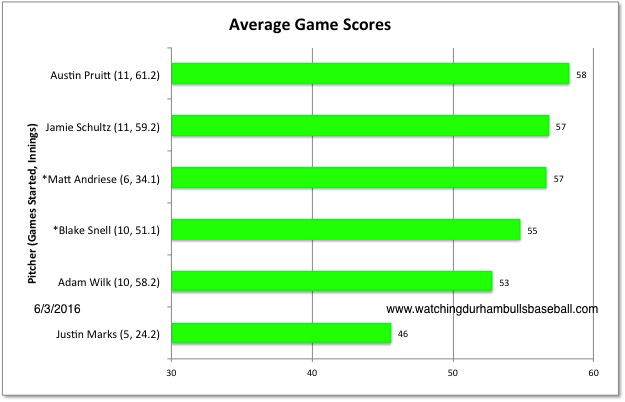 Just for grins, or groans as the case may be, here are the average game scores of this year's Tampa Bay Rays crew. Matt Andriese shows up on this list as well. 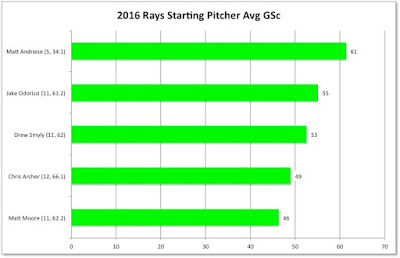 Matt Moore's and Chris Archer's troubles are pretty obvious.